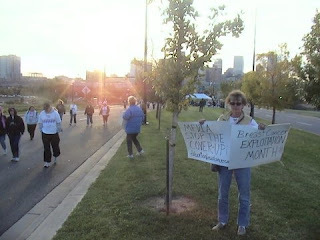 Yesterday was Denver's Susan G Komen Race for the Cure - in case you somehow missed it. Komen has Denver in a strangle hold! Every media outlet in town (it seems) benefits from the huge event and gives glowing coverage - no questions asked. It is difficult to get a word in edgewise if one questions the sanity of racing year after year, while abortion rates continue to skyrocket in younger and younger women with no CURE in sight. The elephant in the room is the abortion breast cancer link which this youtube explains has been known for 50 years. 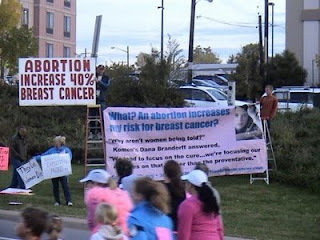 Colorado Right to Life has taken the message about the abortion causality in the breast cancer epidemic for years, only to be booed, hissed and have things thrown at us. And yet we persist because we care about women. And we care about young women making tragic choices which can lead to their early demise. This beautiful young woman explains the carnage in her own life beautifully. We insist on killing children while we are willfully ignorant of the repercussions. I want to be there shen the media elites meet their maker.